In February Adam 'bridged' out of cub scouts into being a boy scout. 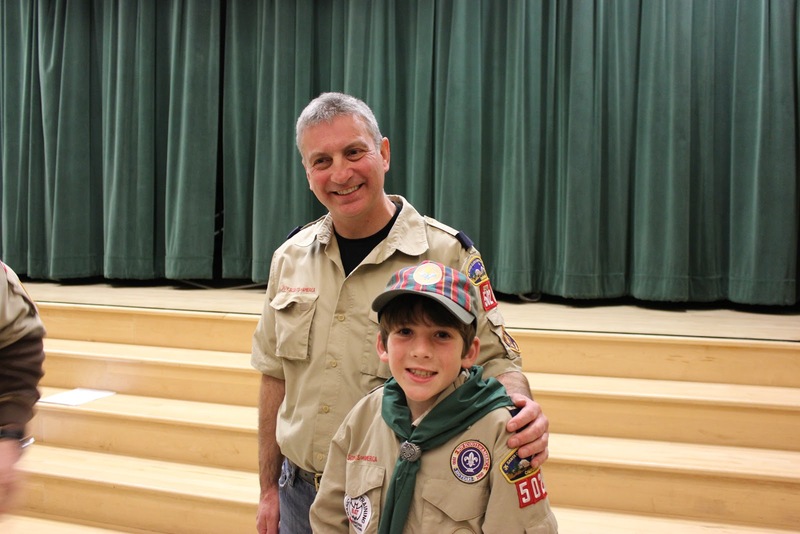 He loves scouts, which has much less parent participation: the boys plan and run the meetings themselves. This photo was taken just after the ceremony. 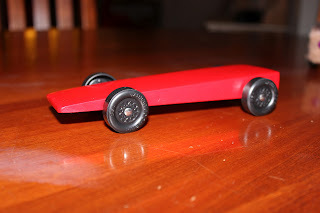 2012 was also his last Pinewood Derby. He initially said he didn't want to participate so was not involved over the weekends that Fin sculpted his car: the Red Fin. To maintain the cars aerodynamics he tuned the car and inserted the lead weights before painting, without realizing that the paint would itself weigh 1oz. The car came in at exactly 5oz. Luckily the 'official' scale weighed the same as ours at home. 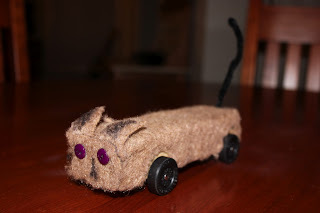 Astonishingly, even with it's terrible aerodynamics, it was not the slowest car by a long chalk! 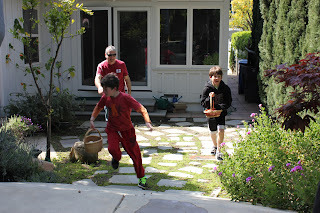 I just loved this action photo of the boys coming out of the house for our traditional egg hunt! 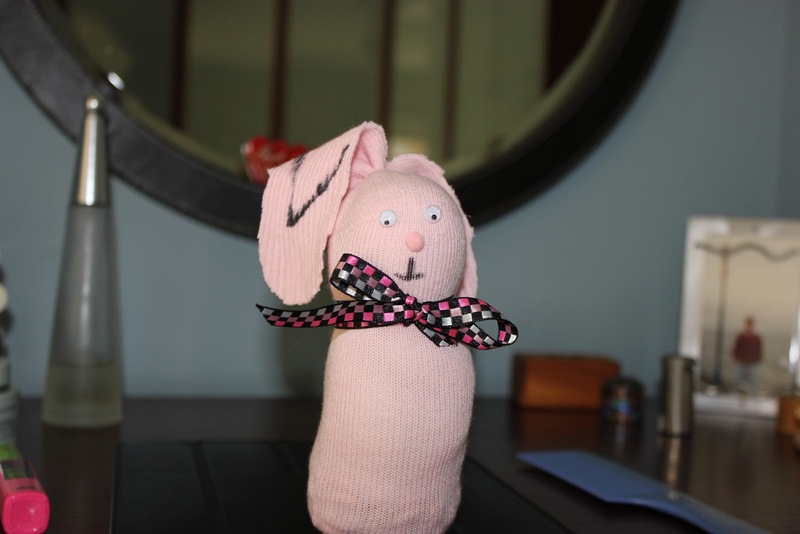 It is ingeniously made from a sock! 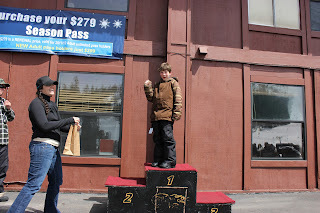 This weekend, the last of our skiing season, Adam entered a Snowboard Cross race at Bear Valley. If you have not seen one before (this was a new sport in the 2006 winter olympics) 4 competitors race down a steep and winding course with jumps. Its an elimination contest. As it happened Adam was the only competitor in the under-13s so they raced him with the rest of the field. In this first heat he raced against Jackson; his snowboard team instructor, and Jake; the competitive team instructor. He acquitted himself well - he came in last ('of course' he says) but not by an embarrassing distance, and he rode well on the course. The race organizers decided that he needed his own prize as the youngest competitor for his sporting spirit. 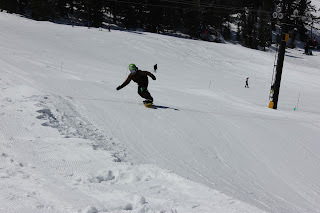 We were very proud of him: it was a steep course and snowboard cross is pretty aggressive. Adam said it was scary to race, especially as the race was so fast. He also told us that one of the (adult) skiing competitors got to the gate at the top of the course and decided not to enter! It was a shame that he had no one in his age group to race against, but he had a wonderful time and everyone was really friendly to him. 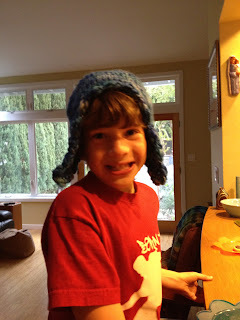 Fin requested an earflap hat and chose some bulky blue wool that has been in my stash for ages: Curious Creeks Tsavo. I made up a pattern based loosely on Kerstins almost pattern earflap hat. He loves it although it badly needs blocking - maybe I can get it off his head once the winter finally leaves! The pattern is McCalls M6229 view F without the pockets or back strap. Its made in a black/red wool tweed that I bought somewhere online. The pattern is so simple that it probably took me less than an hour to make. 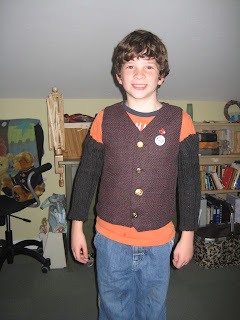 I chose 4 mis-matched gold metal buttons for a slightly steampunk look. We was delighted and especially pleased to wear it with the striped tie that Santa bought him. I decided I needed some legwarmers for the purely practical purpose of keeping my legs warm (duh) while working at home. 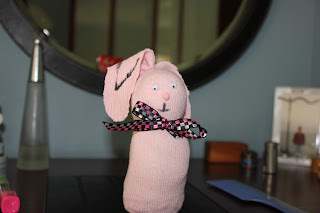 I have wool slippers so wool socks as well is somewhat overkill - hence the legwarmers. 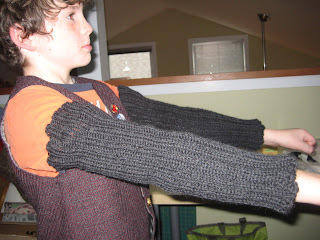 I used the free Mellow legwarmers pattern knitted in black cascade 220. The pattern uses almost the entirety of one skein.